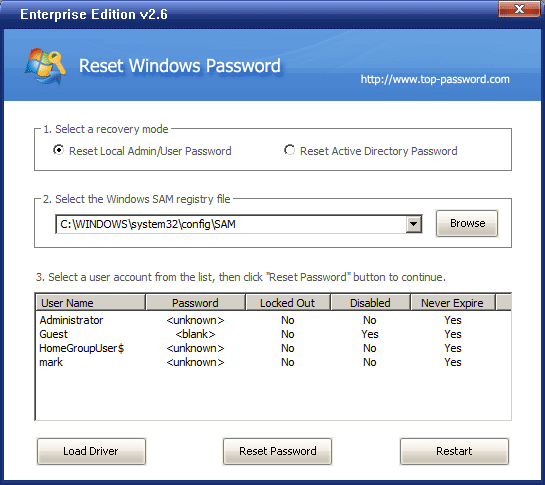 Reset Windows Password is a bootable CD to bypasss, remove or reset lost administrator and user passwords on Windows XP/Vista/2008/2003/2000/7/NT. Instantly gain access to your computer if you have forgotten administrator password or user account has been locked out or disabled. Just boot from the CD and reset Windows system passwords easily and automatically! No need to reinstall Windows! Simply burn Reset Windows Password to a CD, then boot from it. The program automatically detects all Windows installations and user accounts on your computer. Select a user account and click "Reset" button to reset the password to blank, then you can log into your computer with a blank password. * Bypass, remove or reset Windows administrator and user passwords. * Disable the password expiration for local Windows accounts. * Reset Local Security Policy settings. * Disable the "Force Smart Card Login" group policy. * Allow you to reset Windows password to blank instantly. * Reset Windows login passwords for Windows 7, Windows XP, 2003, 2000, NT, Windows XP Professional x64 Edition (64-bit), Windows Server 2003 x64 Edition (64-bit), Windows VISTA, Windows VISTA (64-bit), Windows Server 2008. * Change or reset the forgotten Domain administrator passwords on Windows 2000, 2003 and 2008 Active Directory Server. * Support RAID/SCSI/SATA drives, and FAT16, FAT32, NTFS, NTFS5 file systems.